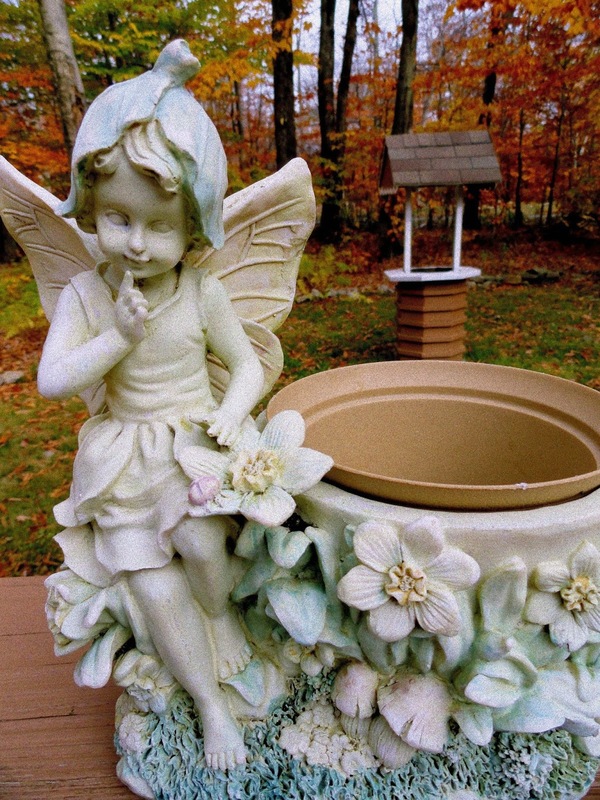 If you're anything like me, you probably had added statuary, fountains, bird baths, decorative pots, and other chotchkies to your garden landscape in the spring or early summer. Now that it's November, its time to clean them up and put them away. All you need is a garden hose or watering can, a large plastic tub, a small cup, warm soapy water, and some cheap toothbrushes. I like to clean my chotchkies ... also known as chachkies and tchotchkes (take your pick) on my back deck. Makes less of a mess than if you do it in the house. Let me start with my favorite garden fairy. By the end of the season she was looking pretty dirty and a bit weather worn. First, I gave her a good dousing with the garden hose. Then I filled up a large basin with warm soapy water and let her soak in it for awhile. and cranny well. Then another good rinse from the garden hose and ... done! Let air dry and pack away until next summer. One down and .... only thirty more to go.